Ad groups sit within Campaigns, within the AdWords account, and they contain keywords and ads. Like campaigns, ad groups also have properties that are inherited by the keywords and ads within them. The keywords within an ad group trigger the ads also contained within the ad group, thus there is an obvious need to keep the keywords closely related to each other so that the ads are as relevant as possible. 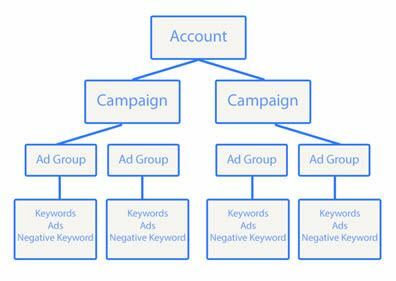 The chart below shows the basic structure of an AdWords account. Below we discuss each of the components of an AdWords Ad Group, we discuss in more depth some of these components in greater detail in other articles where stated. The properties and settings defined at ad group level will override the same setting set at campaign level. When a property is set at both ad group level and keyword level, like Max CPC Bid, it is the keyword level property that is used. Applying properties consistently and logically is important for maintaining large accounts, especially where properties can be defined in multiple locations. This is where you can name your ad group. Naming conventions for ad groups should be logical and descriptive to make them easier to identify. The structure of your account will to some extent determine how you name your ad groups. We often include the primary keyword contained in the ad group within the ad group name, along with other information such as its match type. The default maximum CPC is the default bid used by keywords within the ad group if they do not have specific bids set at the keyword level. This is the maximum you will be charged for a Click when one of the keywords triggers an ad. The default bid is the base figure and onto it are applied any adjustments that you may have in the account such as mobile bid adjustments or ad scheduling bid modifiers. This default bid only applies to the Search network. The default Display Network Maximum CPC is the default bid used by keywords within the ad group if they do not have specific bids set at the keyword level, on the display network. This is the maximum you will be charged for a Click when one of the keywords triggers an ad. This default bid only applies to the Display network. If you are running a CPM campaign and are paying per 1,000 impressions, this is maximum you will pay for those 1,000 impressions. Adjustments are applied to the max CPM in the same way as with CPC’s. (Cost Per Acquisition) Bidding is used if you have conversion optimiser turned on; you can set the maximum you want to pay for a conversion and Google’s system will try and achieve that target. CPA is calculated by dividing the cost by the number of conversions. Targets are recommended by Google and are based on past performance, adding a CPA of $5 when historically it has been $20 is not a reasonable target. This is a much more automated way of managing bids than Manual CPC bidding but it is far from a perfect system and will still require regular monitoring and manual adjustment. Expressed as a value between -90% and +300% this adjusts the existing bids within the ad group by this amount for mobile devices. This will override any mobile bid adjustments set at campaign level. It is also possible to add a mobile bid adjustment of -100% which will prevent the ad group from receiving mobile traffic. This is a fairly crude way of managing mobile traffic, and it can get very complicated when you try to factor in CPA or ROI targets determining bids. That said, it does remain the only way to manage mobile traffic down or up. Bidding on keywords on the display network means that you are targeting sites where these keywords appear. Interests are a way of targeting people based on what interests they have. Remarketing, is serving ads to past website visitors. Targeting you audience based on topics, means that websites that contain content on specific topics you have chosen will be included in your placements. This is a demographic targeting option, if you have a campaign selling dresses, limiting the serving of ads to women is a good way to narrow down your audience to the most relevant people. This is a demographic targeting option, if you have a campaign selling travel insurance to pensioners, targeting people based on their age is a good way to limit impressions to a more relevant audience. Placements are the websites on which your ads are showing, you can specify these sites and manage them or they can be determined by choosing other ways of targeting. All targeting options use placements; they simply identify them in different ways. This allows you to narrow your audience making it more relevant. This is the default for an ad group and essentially turns off any additional targeting. The default for display ad groups is conservative targeting. This tries to get new customers at your current cost per customer and is good if you want more conversions. The default for display ad groups is conservative targeting, so you will typically have to turn this off if you do not want to use it. This option is the previous option on steroids and you can expect it to act like it to! Your CPA will vary with this option as Google casts the net wider to get more users for you. Invariably the wider the net is cast the lower the quality of the traffic gets as visitors become less and less relevant. Properties flow down from ad group level to keyword level, so a paused ad group can have 5 enabled keywords and 3 enabled ads, but none of them will be triggered by a search because the ad group is paused. An enabled ad group does not do the same thing though, for example; an enabled ad group with 5 paused keywords and no enabled keywords will still not trigger ads from showing. Ad groups that are ‘enabled’ are essentially live campaigns. Removed Ad groups are Ad groups that have been deleted; they still appear in the account but are greyed out. The default here is ‘Manual CPC’ which refers to manually controlled bidding. All other bid strategies are things that you will need to have created yourself, in advance in the online version of AdWords. You can learn more about bidding strategies by following the link. Bid strategies can be applied to ad groups or campaigns and are overridden at the ad group level.